Gorrotxategi Gorrotxategi P, Domínguez Aurrecoechea B, Valdivia Jiménez C, García Vera C, Villaizán Pérez C, Sánchez Pina C, et al. Meeting of the Spanish Association of Primary Care Paediatrics within the annual congress of the Spanish Association of Pediatrics. Analysis of scientific presentations. Rev Pediatr Aten Primaria. 2017;19:321-8. Valdivia Jiménez C. Professional joint aspects Pediatrics/Nursing. The pediatric team in Primary Care: training and healthcare. Presentation. Rev Pediatr Aten Primaria. Supl. 2011;(20):53-7. Domínguez Aurrecoechea B, Valdivia Jiménez C. Radiogram of Primary Care Pediatrics in Spain: our place in the National Health System. Rev Pediatr Aten Primaria. Supl. 2011;(20):59-70. Sánchez Pina C, Palomino Urda N, de Frutos Gallego E, Valdivia Jiménez C, Rodríguez Fernández-Oliva CR, Miranda Berrioategortua I, et al. Weak points of child and adolescent Primary Health Care in Spain (first part). Rev Pediatr Aten Primaria. 2011;13:15-31. Sánchez Pina C, Palomino Urda N, de Frutos Gallego E, Valdivia Jiménez C, Lorente García S, Bernad Usoz JV, et al. Weak points of child and adolescent Primary Health Care in Spain (second part). Rev Pediatr Aten Primaria. 2011;13:e1-e14. 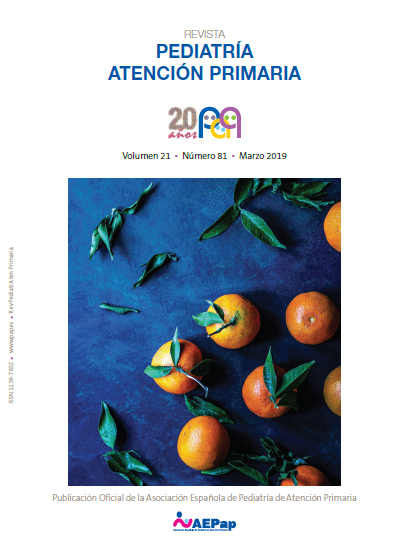 Valdivia Jiménez C, Palomino Urda N. The Primary Care Pediatrics in Andalusia: situation analysis and proposals for the future. Rev Pediatr Aten Primaria. 2010;12(Supl 19):s167-s178. Valdivia Jiménez C, Palomino Urda N, Mateo Rodríguez I. Project of the strategic development of Primary Care Paediatrics in Andalusia. Rev Pediatr Aten Primaria. 2008;10 Supl 2:S81-94. Fernández Segura ME, Valdivia Jiménez C, López Verde L, Rodríguez Sánchez I, Marfil Olink S, Pareja Campos S, et al. Situation of Primary Care nurses’ care to children in a sanitary district. Rev Pediatr Aten Primaria. 2008;10 Supl 2:e90-1. Valdivia Jiménez C, Palomino Urda N. It is time of reflection. Rev Pediatr Aten Primaria. 2008;10:11-5.